There are so many important issues affecting millions of Americans, but it can be hard to stay focused. Amid the numerous scandals involving Russia, Stormy Daniels, racism, and misogyny, it’s easy for some issues to get less attention. 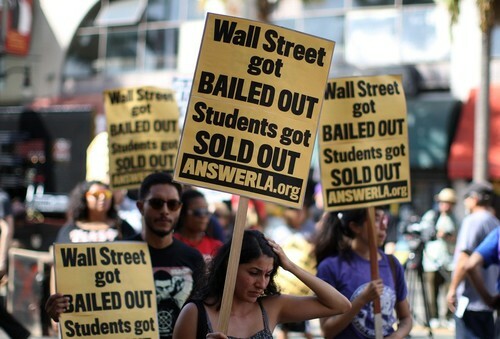 While the media hasn’t spent a lot of time on student debt, it’s still a very large problem. Tax Day was last week—and many filers got federal tax refund checks (or are awaiting them) thanks to the Earned Income Tax Credit (EITC). Unfortunately, many who are counting on getting that extra boost of money when they file may find that the government is keeping the money. USA Today recently reported that national student loan debt continues to balloon—and that means less money for some of the people who really need it. [A] USA TODAY review shows that the U.S. Department of the Treasury during the 2017 federal fiscal year collected nearly $2.6 billion owed on defaulted federal student loans. The total represents the highest ever in terms of dollar collections, according to Treasury’s Bureau of the Fiscal Service. A look at these numbers shows that the student debt crisis is far from gone—and it isn’t going to go away unless we do something about it. Too many people are in the position of wanting to pay, but being unable to. The collections, representing more than 1.3 million defaulted federal student loans, also increased by $200 million from the 2016 federal fiscal year. Collections for federal student loan debts have risen steadily as the Department of Education’s debt portfolio increases, according to the Treasury bureau. Formally known as tax refund offsets, the government seizures have taken place even as total U.S. student loan debt has ballooned to an estimated all-time high of $1.4 trillion. Nearly $5.8 billion in direct federal student loans entered first-time defaults from July through September last year, the highest quarterly total since at least 2015, government records show. While Uncle Sam may be pleased to be recovering more money, this trend comes at a cost. These seizures can actually be counterproductive and keep a struggling borrower in poverty. Taking a large chunk of cash a student borrower has been counting on can have dire effects. According to a recent report from the National Consumer Law Center, many low-income borrowers depend on the tax return for a roof over their heads. One of the most common complaints from borrowers is that losing their tax refund will impacttheir ability to stay in their home or to move their family into a safe home. Many borrowersreported being behind on rent or utilities and had been relying on their expected refund to getcaught up, and to ensure that they could stay in their homes. Some reported feeling unsafe intheir current situation and had hopes that their refund would give them the means to move to a safer location. The government is getting more money that is owed to them—but at what cost? Is it truly helpful to punish low-income people who “did the right thing” and got an education by taking away one of the new extra boosts of money they’ll ever have? By trying to repay debts by seizing families’ EITC—something is meant to help the most financially vulernable—keeps them in a vicious cycle that got them into financial trouble in the first place.